"Tokyo 2020 - The Radioactive Olympics"
25.03.2019 Tomorrow in one year, on March 26 2020, the Olympic torch relay will start in the radioactively contaminated Fukushima Prefecture. This is why tomorrow, a group of anti-nuclear oranizations in Germany, Switzerland, France and Japan will launch an international information campaign entitled „Tokyo 2020 - The Radioactive Olympics”. The campaign will focus on the ongoing radioactive contamination of parts of Japan due to the nuclear catastrope of Fukushima, which began eight years ago. 11.03.2019 Eight years after the world’s most complex nuclear disaster, the damaged Fukushima Daiichi nuclear power plants and spent fuel ponds are still leaking and dangerous, vast amounts of contaminated water continue to accumulate, 8000 odd clean-up workers labour daily and will need to for many decades, the needs of people exposed to radioactivity are still neglected, no one is in prison for a disaster fundamentally caused by the negligence of the operator and the government, and most of the lessons of Fukushima have yet to heeded. 20.12.2018 The Don’t Nuke the Climate Coalition issued the following statement on the conclusion of the conference: “Nuclear energy confirmed itself to be a major ‘Ambition-Killer’ at COP24 this year. Most of the countries that blocked adoption of the crucial Intergovernmental Panel on Climate Change (IPCC) report absurdly and hypocritically promoted nuclear power and fossil fuels as ‘practical and realistic’ solutions to global warming. Nothing could be further from the truth. After 60 years of nuclear power, its track record and environmental impacts are clear: nuclear is too dirty, too dangerous, too expensive, and too slow to solve global warming. Find out more at www.dont-nuke-the-climate.org. 17.08.2018 In 2020, Japan is inviting athletes from around the world to take part in the Tokyo Olympic Games. We are hoping for the games to be fair and peaceful. At the same time, we are worried about plans to host baseball and softball competitions in Fukushima City, just 50 km away from the ruins of the Fukushima Dai-ichi nuclear power plant. It was here, in 2011, that multiple nuclear meltdowns took place, spreading radioactivity across Japan and the Pacific Ocean – a catastrophe comparable only to the nuclear meltdown of Chernobyl. 16.12.2016 On December 9th, Dr. Alex Rosen, Vice-President of IPPNW Germany, was invited to talk on the subject of nuclear energy and climate change at the MedAct Conference "Healthy Planet - Better World". The subject of his talk was "Why nuclear power ist not an answer to global warming". In it, he argued that nuclear power was not a good investment and that the true and long-term costs and effects of nuclear power far outweigh its potential short-term benefits. He named the detrimental effects of uranium mining and nuclear waste on the environment an on public health and listed the most relevant studies on the effects of uranium mining and civil nuclear energy on childhood leukemia, lung cancer and other radiation-related diseases. 18.11.2017 From November 6th to 17th, 2017 the UN Climate Conference was held in Bonn, Germany. During the conference the nuclear industry was intensively lobbying for access to climate funding mechanisms such as the UN Green Climate Fund for its outdated and dangerous nuclear technology. The international campaign “Don’t nuke the climate” forwarded a letter to the German environmental minister Barbara Hendricks which was signed by 70 scientists. In this letter scientists argue that nuclear energy is not the solution to climate change: It is too dirty, too dangerous and also would take too long to be a meaningful answer to global warming. Moreover, the new nuclear power plant Hinckley Point in the UK is being built – not to solve energy problems, but to hide the costs for the British nuclear weapons program. 11.10.2016 How a society deals with the victims of a catastrophe tells you more about it than statistical data like its GDP or its unemployment rates. Since 2011, Fukushima Medical University regularly examines the thyroids of all inhabitants of Fukushima Prefecture, who were below 18 years of age at the time of the Fukushima nuclear catastrophe in order to detect cancer or precancerous lesions in time. While the costs for patients under the age of 18 are generally covered by the state, families have to pay doctor fees in advance and only get reimbursed after a certain delay. Furthermore, the Japanese health system generally requires patients older than 18 to pay 30% of all medical costs themselves. This also applies for thyroid exams for people who were exposed to radioactive fallout, as well as for potentially necessary biopsies, surgical operations or long-term therapies. 12.10.2016 In Fukushima, an extensive screening on thyroid cancer in children is running for almost 5 years now. Whereas the pro-nuclear Japanese government deliberately downplays the impacts of the multiple nuclear meltdowns, scientists, physicians and parents associations were at leastable to enforce this screening. Despite all justifiable criticism of this study like its limitation to Fukushima Prefecture, the lack of transparency or the influence of the nuclear lobby on Fukushima Medical University, which carries out the examination, this screening provides the possibility of early detection and therapy of thyroid cancer. The 2016 Nuclear-Free Future Award Ceremony, in cooperation with Earthlife Africa Johannesburg, will take place on 17 November at Matlapeng Country Estate in, Vanderbijlpark, Johannesburg, South Africa. The German affiliate of IPPNW calls on the Belgian government to immediately shut down the nuclear reactors in Doel and Tihange. They also support legal proceedings by the city of Aachen and the states of Northrhine-Westphalia and Rhineland-Palatinate against the continued operation of these two nuclear facilities. Moreover, the physicians appeal to the German government to use its political leverage within the EU to press for an immediate shutdown of the nuclear reactors. Marking the commemorations of the nuclear disasters in Chernobyl and Fukushima, IPPNW Germany called on 26.04.16 on the German government to work towards a speedy closure and decommissioning of all nuclear reactors in Europe. One early morning thirty years ago, humankind was made painfully aware of the dangers of nuclear energy when reactor 4 of the Chernobyl nuclear power plant exploded. For weeks afterwards, radioactive clouds spread harmful contamination across the whole of Europe. Germany was also affected, particularly the states of Bavaria and Baden-Wuerttemberg. Last weekend IPPNW Germany held an international congress in Berlin to commemorate the nuclear disasters in Fukushima and Chernobyl, attended by about 350 participants. Scientists and activists from Japan, Belarus, Ukraine and other parts of the world came together in the "Urania" congress hall to exchange information and views on research and to network. Our main aim was to link these anniversaries - five for Fukushima and thirty for Chernobyl - with the demand for a phase-out of nuclear power and promotion of an energy revolutiion. 19.11.15 There is a clear global downtrend in the civil use of nuclear power, as documented by the annual World Nuclear Industry Status Report and as discussed at the international Symposium on « Nuclearisation of Africa » concluded on the 19th of November in Johannesburg. Testimonies by participants from Niger spoke about the heavy toll of the 40 years exploitation of Uranium in their country. 04.05.2015 The advertising campaign for nuclear energy starts at the airport in Istanbul. Waiting for our suitcases we look at an poster advertising “Türkiye nükleer” which shows three young laughing boys: "Strong Turkey will produce new clean energy - energy from the Akkuyu NPP ". Also on the way to the hotel, on the bridges, on the tram, the same slogans for the Akkuyu nuclear power plant appear. Nuclear energy is being praised as being a clean, safe and sustainable energy on the road to an independent Turkey. Prime Minister Erdogan and Minister of Energy Taner Yildiz show that they are determined to get two nuclear power plants at any cost. In the year 2015 there exist approximately 440 nuclear power plants (NPPs) in 28 countries, often in areas of high population density. After the NPP accidents of Three Mile Island (USA, 1979), Chernobyl (1986) and Fukushima (Japan, 2011) nuclear disasters unfortunately can no longer be considered hypothetical or unlikely. Among the diversity of the causes of accidents, technical malfunctions, human error, aging facilities, fire risk, exceptional climatic events, terrorism and plane crashes have to be mentioned. Last weekend, doctors, scientists and environmental experts met in the town of Ronneburg and discussed the long term health and environmental effects of uranium mining. Between 1946 and 1990, the Soviet-German "Wismut" company ran a vast network of uranium mines in this region between the Erzgebirge in Saxony and Eastern Thuringia, becoming the largest supplier of fissile material to the Soviet nuclear weapons program (see also www.ippnw-students.org/Japan/Erzgebirge.pdf). 24/04/2014 Physicians Against Nuclear War in Japan has published a statement regarding the Fukushima nuclear disaster that deserves a wider international audience. It protests recent Japanese government pressures for return of displaced people to areas radioactively contaminated from the Fukushima nuclear disaster; continued tolerance of radiation exposures for the general public, which IPPNW has repeatedly condemned as unacceptably high; and transfer of the onus of protection to individuals. Three years ago, thousands of people died and almost half a million lost their homes in Japan's worst peacetime disaster. But the catastrophe isn't over as experts still struggle to contain radioactive leaks from the stricken plant. 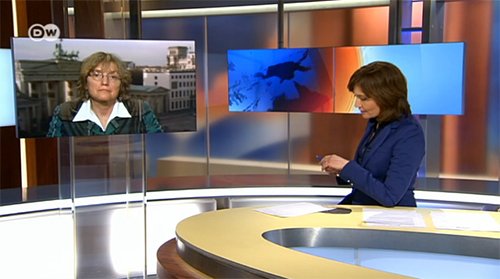 DW spoke to Angelika Claußen of International Physicians for the Prevention of Nuclear War Germany. 11.03.2014 The world’s most complex nuclear power plant disaster continues three years on, and will continue for many years hence. Uncontrolled flows of around 1,000 tons of groundwater per day into the site continue; 400 tons of water daily flows into the damaged reactor and turbine buildings where it becomes radioactively contaminated. Some is collected—more than 430,000 tons of radioactively contaminated water is now stored in about 1,000 makeshift tanks, many of which are bolted rather than welded, lack even gauges to show how full they are, and have leaked repeatedly. [October 25, 2013] As physicians concerned with the effects of radioactive fallout on human health and the ecosystem, we have reviewed the upcoming United Nations Scientific Committee on the Effects of Atomic Radiation (UNSCEAR) report to the UN General Assembly. We appreciate the effort made by UNSCEAR committee members to evaluate the extensive and complex data concerning the Fukushima nuclear catastrophe. While parts of the UNSCEAR report will be useful in the future to assess the consequences of the nuclear meltdowns on public health and the environment, we believe the 2013 UNSCEAR report systematically underestimates the true extent of the catastrophe. Many of the assumptions are based on the two WHO/IAEA reports published in May 2012 and February 2013, which did not accurately portray the true extent of radiation exposure, followed faulty assumptions, ignored the ongoing radioactive emissions over the past 2½ years and excluded non-cancer effects of radiation. 30.05.2013 The IPPNW Board of Directors has issued a statement about the ongoing public health crisis resulting from the March 2011 nuclear reactor disaster in Fukushima. The statement makes reference to a report from Anand Grover, UN Special Rapporteur on the right to health, an advance, unedited copy of which has been made available by the Office of the High Commissioner for Human Rights. 06.03.2013 On 11 March 2011, a nuclear catastrophe occurred at the Fukushima Dai-ichi nuclear power plant in Japan in the wake of an earthquake and due to serious safety deficiencies. The initial health consequences of the nuclear catastrophe are now, two years after the incident, scientifically verifiable. Similar to the case of Chernobyl, a decline in the birth rate was documented in the nine months following the nuclear catastrophe. In the Fukushima Prefecture alone, some 55,592 children were diagnosed with thyroid gland nodules or cysts. In the long term there are many expected cases of cancer due to Fukushima. 20.09.2012 Following the IPPNW (International Physicians for the Prevention of Nuclear War) World Congress in Hiroshima on August 24-26, the related symposium in Tokyo, and their visit to Fukushima to meet with local medical professionals on August 28, international medical experts from IPPNW will held a press conference on the medical and health issues related to Fukushima on Wednesday August 29. 06.03.2012 Following an earthquake on March 11th 2011 a nuclear disaster took place in the Japanese nuclear plant at Fukushima. All over the world credibility has been given to the myth that the tsunami following the earthquake was the sole cause of this nuclear catastrophe. Why? Because Tepco and the Japanese government publicly portrayed the tsunami as being more to blame than the earthquake. This attempt at historical revisionism – obviously motivated by self-interest – has little to do with reality. This can be seen if one carefully analyses the events that actually took place. 14.11.2011 In September 2011, Gundremmingen NPP located between Ulm and Augsburg in Southern Germany emitted much larger amounts of radioactive noble gases during inspection/refuelling than are emitted during normal power operation. According to the International Physicians for the Prevention of Nuclear War (IPPNW) in Germany, the normal emission concentration during the rest of the year is about 3 kBq/m³, but during inspection/refuelling (in the afternoon and evening of September 22nd) this concentration abruptly increased to ~700 kBq/m³ with a peak of 1,470 kBq/m³. 27.10.2011 An international team of researchers from Norway, Austria, Spain and the United States concluded in a study, published on October 21, that the amount of the noble gas xenon 133 released during the Fukushima disaster was a factor 2.5 times higher than released in Chernobyl. According to their report, there is “strong evidence“ that the start of the release was on March 11 at about 3 pm (Japanese time) and therefore before the tsunami hit the coast. This leads the scientists to believe that the earthquake at 2.46 pm may have led to “structural damage” of the reactor. The Swiss chapter of the physicians for social responsibility / for the prevention of nuclear war (PSR/ IPPNW, Peace Nobel prize 1985) has taken, with satisfaction, notice of today’s vote by the the council of states, promoting the definite phase-out of civil use of nuclear power at the end of the lifespan of the existing 5 powerplants. 20.09.2011 Current radiation value limits for contaminated foodstuffs in the European Union and in Japan do not offer enough health protection since they permit the population to be unnecessarily exposed to high health risks. This is the conclusion reached in the report, Calculated Fatalities From Radiation: Officially Permissible Limits for Radioactively Contaminated Food in the European Union and Japan, released in Berlin today by the consumer advocacy organization foodwatch and the German Section of the International Physicians for the Prevention of Nuclear War (IPPNW). The report is based on a study by Thomas Dersee und Sebastian Pflugbeil (German Society for Radiation Protection). An alliance of anti-nuclear initiatives supports protestors in Tokyo today in their call for an end to civil use of nuclear energy in Japan. Six months after the nuclear disaster the Japanese government refuses to deliver the help still urgently needed by the people in the area of Fukushima. There is still no state program for the evacuation of the people living in areas more than 20 kilometers from the damaged reactor. 26.04.2011 I was dismayed to learn that the Ministry of Education, Culture, Sports, Science and Technology earlier this week increased the allowable dose of ionizing radiation for children in Fukushima Prefecture. The dose they set, 3.8 microsieverts per hour, equates to more than 33 millisieverts (mSv) over a year. This is to apply to children in kindergartens, nursery, primary and junior high schools. Let me try to put this in perspective. 07.04.2011 The March 11 earthquake and tsunami in Japan and complicating nuclear crisis throw into sharp focus concerns about exposure to ionising radiation. What is it, how is it harmful, how much is too much? Inside a nuclear reactor, the radioactivity is increased about a million times as some of the uranium or plutonium is converted to a cocktail of hundreds of different radioactive elements. 25.03.2011 The physician’s organisation IPPNW Germany and the President of the German Society for Radiation Protection (GfS), Sebastian Pflugbeil, believe that an extension of the evacuation zone around the damaged Fukushima nuclear plant is urgently needed. They call on the Japanese government to evacuate the population promptly from a much wider area, in particular to ensure the protection of children and pregnant women. 24.03.2011 The aftermath of the nuclear reactor catastrophe in Chernobyl and Fukushima, and the fates of the people suffering from nuclear contamination worldwide, are the focus of this international congress in Berlin, April 8 to 10. 25 years after the Chernobyl disaster, our planet is currently witnessing yet another vast nuclear tragedy which underlines dramatically the risks of nuclear technology. Nuclear energy kills. Join us to hear information about and discuss the dangers of the nuclear chain. 23.03.2011 IPPNW Germany has warned for many years that collusion between the World Health Organisation (WHO) and the International Atomic Energy Agency (IAEA) prevents them from protecting the public from the risks posed by nuclear power. The physician's organisation and Nobel Peace Laureate strongly criticises the IAEA for inadequately informing the public on the situation at the Fukushima nuclear complex and the WHO for downplaying potential health consequences resulting from a meltdown. 18.03.2011 After the nuclear disaster in Chernobyl, the world was shocked by babies born with deformities and the high rate of prenatal defects in the affected areas. How dangerous is the situation in Japan for children? In this article, IPPNW physician Dr. Winfrid Eisenberg tells Deutsche Welle that unborn children are most at risk from radiation. Melbourne, 14 March 2011: The unfolding tragedy in Japan has highlighted the dangerous reality of nuclear power and its potential severe health consequences, said the Medical Association for the Prevention of War (MAPW) and International Campaign to Abolish Nuclear Weapons (ICAN) today in a joint statement. “Our thoughts are today with the hundreds of thousands of traumatised inhabitants of the Fukushima district - now fleeing the radioactive plume over northern Japan - whose experience of horrendous natural disaster has been amplified by avoidable man-made catastrophe,” said Dr Bill Williams President of MAPW and board member of ICAN Australia. At the annual meeting of the German IPPNW affiliate this weekend in Frankfurt/Main, physicians passed a resolution calling for all nuclear plants worldwide to be closed down. The catastrophe at the Fukushima nuclear installation was a central topic for the 100 doctors over the weekend, who organised a spontaneous demonstration in central Frankfurt to protest against continued use of nuclear power. IPPNW experts on nuclear safety, radiation and health were called upon to give numerous interviews to the media and appear on nationwide television. 31.08.2010 The International Physicians for the Prevention of Nuclear War (IPPNW) adopted a resolution at its International Council meeting on Sunday in Basel, Switzerland, calling for a ban on uranium mining and the production of yellowcake (uranium oxide). The resolution described both processes as “irresponsible” and “a grave threat to health and to the environment”. 10/08/2010 Germany's nuclear power plants are surrounded by fences and guarded by security personnel. But NGOs say they're inadequately protected from floods, earthquakes and fire - and possibly also from terrorist attacks by air. 12.10.2009 On 28-29 August 2009 the Greek Affiliate of IPPNW participated in the PanEuropean Energy Conference in Svishtov, Bulgaria and protested against the nuclear power plant currently under construction in Belene. Jan Havercamp, Greenpeace energy campaigner, declared that all nuclear power plants will stop because the costs are too high. 15.02.2008 In the late1980s and early 1990s, a number of UK studies revealed increased incidences of childhood leukemias near the nuclear facilities at Windscale (now Sellafield), Burghfield and Dounreay. The official reaction to these increases was that the estimated radiation doses from intakes of nuclides released by these facilities were too low (by 2 to 3 orders of magnitude) to explain the increased leukemias. 11.01.2008 "Young children develop cancer more frequently when they live near nuclear power plants (NPP). It has to be assumed that radioactive emissions from NPP stacks are indeed not as harmless as previously believed. Now it is time to act." 20.12.2007 The World Health Organization (WHO) works towards the resolution of public health problems and to this end, it is mandated "to assist in developing an informed public opinion" (WHO Constitution, 7 April 1948). However, since the WHO/IAEA Agreement (WHA12-40) was signed on 28 May 1959, the WHO appears to be subordinate to the International Atomic Energy Agency (IAEA). As health professionals, we support the request that WHO, in line with its constitution, recover its independence in the area of ionising radiation. 08.12.2007 The german section of IPPNW has initiated a study, which approves that children under the age of five living near nuclear power stations have contracted cancer at a greatly higher rate than the national average. The study was paid for by the German Federal Radiation Protection Agency (BfS) the government's main adviser on nuclear health. It was conducted by the German Register of Child Cancer, an office in Mainz which is funded by the 16 German states and the federal Health Ministry. The risk of cancer increased by 60 percent for children living less than five kilometres(three miles) from a nuclear power plant, according to the study. 02.10.2007 In Rhodes was created a new terenean Antinuclear link named Mediterranean No Nuclear Neighbourhood (MN³). In the Secretariat Maria Arvaniti Sotiropoulou was elected representing the Greek Affiliate of IPPNW. Following you find the declaration of MN³. "We, the Organizations from 9 countries of the wider area of the Mediterranean gathered in Rhodes, September 27-29 2007, and signed the Protocol of Cooperation for the Creation of the Mediterranean No Nuclear Neighbourhood, address the citizens of our countries with a hopeful dream..."
14.08.2007 The German affiliate of IPPNW has signed a letter from the global network "Abolition 2000" asking member states of the Nuclear Suppliers Group to veto the proposed US-India nuclear deal. The signatories of the letter view the deal as "deeply flawed" and regard the consequences for the internation non-proliferation regime to be so severe, that only the next Review Conference of the Non-Proliferation Treaty should take a decision on it. 27.07.2007 Irregularities at nuclear reactors in Germany and Japan in recent weeks have rekindled safety fears and raised tough questions about nuclear energy amid increasing environmental concerns. Despite the recent slew of incidents at nuclear power stations, the International Atomic Energy Agency (IAEA) said the errors in Germany, Sweden and Japan were exceptions and certainly did not pose a danger. Critics of nuclear energy, however, don't buy the argument. Henrik Paulitz of IPPNW said the recent German incidents were dangerous. 29.07.2007 The International Atomic Energy Agency (IAEA) was founded on July 29th, 1957. On the occasion of this 50th anniversary IPPNW-Germany has created an electronic birthday card to the IAEA that criticizes the agency's role in promoting so-called peaceful uses of nuclear energy. The e-card can be viewed, personalized, and signed at www.iaea.ippnw.de. According to its founding statute, the aim of the IAEA is to prevent nuclear weapons proliferation while, at the same time, enlarging the peaceful use of nuclear energy. IPPNW believes that this is a self-contradictory mission. Meta-analysis of Baker P.J. & Hoel D.G. 15.07.2007 In response to the cluster of childhood leukaemia reported near the Sellafield nuclear site in Great Britain in 1984 there have been numerous studies assessing the possible risk of childhood leukaemia due to irradiation from nuclear sites. While many studies have found positive associations, few results have been significant. Although there is little doubt that exposure to radiation increases the risk of developing leukaemia there is disagreement as to whether the amount of exposure received by children living near nuclear sites is sufficient to increase risk. Hardly noticed by the public, the Chernobyl Forum of the United Nations was founded in 2003 as a strong-man act. On 6 and 7 September 2005, the results of its working groups were presented at a conference organised by the IAEA in Vienna. The purpose of this complex co-operation over several years was to formulate official versions with regard to the twentieth anniversary of the disaster on the highest possible level, namely that of UN organisations and governments, to conclude all research projects about Chernobyl and to propagate the thesis that the main problem of the region was poverty, not the Chernobyl disaster. If you want peace, work for health! 10.09.2006 The 17th IPPNW World Congress took place in Helsinki, Finland from 7th to 10 September 2006. The motto of the Congress was War or Health? Themes of the congress were: nuclear abolition; small arms and the public health impact of war; and energy security. A statement was issued at the close of the congress. 11.09.2006 Solange Fernex, a French pacifist and politician born in 1934 and resident in Biederthal (Alsace), died of cancer on 11 September at around 3pm. After living through some difficult stages and a recent short remission, she slipped away gently. 05.04.2006 The Chernobyl catastrophe changed the world. Millions of people were made victims overnight. Gigantic stretches of land were made uninhabitable. The radioactive cloud spread all over the world. An understanding of the dangers of the use of nuclear energy grew in a countless number of minds. Even in Germany, people became sick and died due to the radiation they incorporated into their bodies through eating and breathing. An analysis of the effects of Chernobyl is massively handicapped by the number of very varying levels of facts. Essential data on the course of events of the catastrophe and its health effects are not publicly available. Only 50 deaths caused by Chernobyl? 06.04.2006 A report published today by the physician's organisation IPPNW in Germany and the German Society for Radiation Protection contradicts the claim by the International Atomic Energy Agency (IAEA) that less than 50 people died as a result of the accident at Chernobyl (see IAEA press release of September 5th 2005). The facts presented by Dr. Sebastian Pflugbeil, President of the German Society for Radiation Protection, show that the IAEA figures contain serious inconsistencies. 12.11.2005 The Swiss affiliate of PSR / IPPNW has held a Symposium "Health of Liquidators (Clean-up Workers), 20 Years after the Chernobyl Explosion". With the support of the Faculty of Medicine of the University of Berne, they organized a scientific program, dedicated to the effects of artificial radioactive radiation in 800.000 clean-up workers, the so-called liquidators. These were mainly younger adults (mean age 33 years) who were enrolled and had to decontaminate heavily contaminated areas, close to the exploded Chernobyl nuclear reactor. Half of them were military personnel from all republics of the Soviet Union, the others were civil technicians, miners, pilots, drivers, healthy young men and also women. 05.09.2005 On the occasion of the UN Chernobyl Forum from September 6 to 7 in Vienna on the effects of the reactor meltdown on the environment and health, IPPNW Germany demands the revocation of the agreement between WHO and IAEA of May 28 1959. This agreement ensures the proponents of nuclear energy and physicists in IAEA control over research programmes, their results and publications of WHO physicians that cover the health effects of the civilian use of nuclear energy and ensuing accidents.